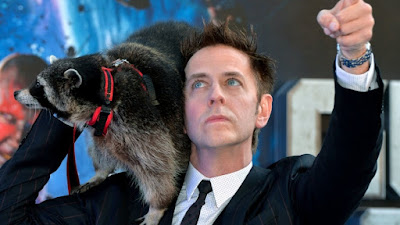 Even with his firing by Disney still fresh in everybody's minds, don't expect James Gunn to be on the bench for long. THR reports that multiple studios are eager to work with the Guardians of the Galaxy director, and you might be surprised to learn one of his potential suitors is Marvel Studios. Say wha? The site says Gunn has “been approached by several top producers and executives at major studios dangling big film projects.” One of those is Warner Bros., which brings to mind thoughts of Gunn taking on one of their DCEU properties. I can see Gunn doing a Legion of Superheroes movie and it being incredible, just sayin'. But before that can happen he has to go finish up negotiations with Disney and Marvel, which is why you haven't heard anybody from either side really saying anything about the situation. There's a good chance Marvel will go ahead and use Gunn's script for Guardians of the Galaxy Vol. 3, which should make Dave Bautista happy, but he won't be asked to return as director. Due to Gunn being let go from his contract for actions that took place well before he ever signed with Disney, the company is likely to have to pay him off in a big way, upwards of $10M. I'd say that's a pretty sweet golden parachute. What's more, sources tell the trade that Marvel would be open to working with Gunn again, just not on Guardians 3. He could possibly take on a brand new property. “An end-all verdict hasn’t been issued and conversations with Marvel are still ongoing,” sources said. It'll be interesting to see how fans react to Gunn's next move. He was sort of a niche filmmaker before he landed at Marvel, but now he's built quite a following. And I suspect this whole situation, which has rubbed a lot of people the wrong way, will only make him an even hotter commodity.